Fertilizer has been critical to crop yields from the start of agriculture, and the application of artificially fixed nitrogen has been fundamental to crop yield increases since the 1970s. However, finding definitive data about absolute amounts, costs, effects on yields and changes in application is tricky – with dispersed literature, many units, confusion with sales and trading numbers. There are many interesting gems highlighted in the presentation: for US corn production, the cost of “land”, “power & machinery” and fertilizer each account for between 22% and 25% of grain production costs, while seed accounts for 15%. Chemicals and labour at 5% each are a much smaller proportion (slide 9). The cost-proportion for fertilizer has doubled since the 1990s, presumably reflecting both the increased cost of energy and reduced cost of other contributors. The seed contains all the genetics that I and my lab are interested in developing: I’m not sure if the 15% is lower or higher than I expected! 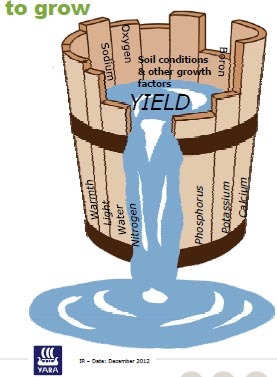 1 tonne of grain requires about 25kg of nitrogen, and the return on investment in nitrogen is about 9-times. Poultry, pork and beef production require 2x, 4x and 7x more fertilizer per kg product compared to the cereals (slide 27). This brings me on to what I was actually surfing the web to find. The news media have been full of the statistic that natural gas costs in the US are less than a quarter of those in Europe (slide 68). More than 90% of the production cost of ammonia fertilizer is the cost of gas (slide 77)! Media commentators tend to note the implications for industry, but I haven’t heard any comment that this differential means the end of the European fertilizer industry and complete reliance on imported nitrogen fertilizers for our food production. Adverts below are not associated with this site – they are put there by the hosting organization. This entry was posted in cereals, Environment, Farming, Farming, Literature, Species, Sustainability and tagged ammonia, breeding, farming, fertilizer, nitrogen, phosphate, yield. Bookmark the permalink.